How many times have you seen my love of bacon professed on this blog? Anyone who knows me knows that I eat relatively healthy. I’m a salad and vegetable girl. In fact, my mostly vegetarian streak is still going strong (save for the vat of Bolognese I made last week). However, my kryptonite isn’t chocolate or ice cream. It’s pig. Sausages. Prosciutto. B a c o n.
I was introduced a week or so ago to a product that, well, makes my heart flutter a little bit. I was a skeptic. I really was. Real tasting artificial bacon flavoring!? Yes. It’s true. Let me introduce you to Bacon Salt. Bacon flavored salt. Two great tastes that taste great together. I ordered the three pack: Original, Peppered, and Hickory. I have tried the first two – the third flavor is going to the boy’s recipe test kitchen. I’m hearing mumblings of using in a Bloody Mary…but I’ll report back when I know more. This is a wonderful way for those people with dietary restrictions to add bacon flavor to foods. If you’re on a diet and can’t justify the added fat and calories, this is for you. Veggies who love the taste but not the guilt will LOVE this. Are you Kosher? You need this, too. The taste is quite authentic…but be warned…this is SALT…so this product cuts out the need for both pig AND salt. I tried my two flavors with stellar and realistic bacony results, which you’ll see here in this post. Both are easily prepared, veggie friendly recipes that were enhanced with BaconSalt. If you do give it a try, let me know what you think! – Boil pasta in large pot according to directions. Reserve 2 tablespoons of pasta water and add both back into large pot. On extremely low heat, add Mascarpone cheese and red chili flakes and mix thoroughly. When cheese melts to form sauce, add arugula and toss through until just wilted. Remove from heat and season with BaconSalt to taste. Serve immediately. – Heat large saute pan or heavy skillet on medium heat. 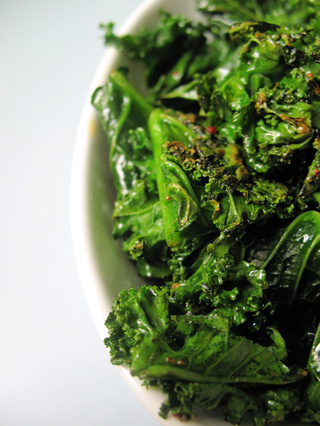 Add dried kale to pan and allow to begin to wilt. Drizzle with extra virgin olive oil and keep cooking. When 3/4 of the way to desired doneness, add red chili flakes and BaconSalt. Continue to cook until desired tenderness. Make sure you scrape up the charred bits and the crispy parts – delicious and bacony! I admit it, I am a skeptic. 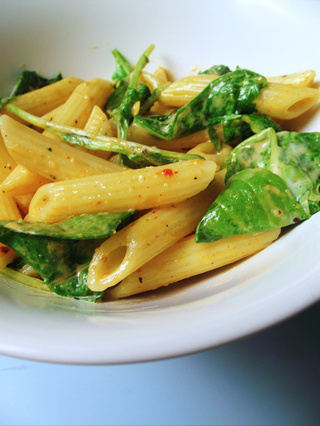 Could you send over some of that Penne Pasta with Arugula, Mascarpone, and “Bacon”? Oh, my! Just so I can be sure, that is. I saw the bacon salt on another blog and I was instantly intrigued. They had not tried it yet, so it is nice to see someone use it in a recipe. Can you say, bacon scented air freshener? I can’t wait to try some other recipes with it. Of course, nothing is a true replacement for the texture and taste elements that *real* bacon provides in a dish…but this is easy and darned close! I mean it can’t be good for you, there’s no actual food group it belongs to. It’s clearly chemistry not food and I have to say that I’d buy it. Do you think it would work with chocolate? I bet it would be wonderful with fruit, cantaloupe in particular. oh yum! i’m a vegetarian and meat like bacon and sausages are what i miss most. i can imagine putting the bacon salt on everything (especially scrambled eggs). Fascinating. I might have to order some for Christmas stocking stuffers! You KNOW this, man. You know whats coming. Brace yourself. I read this when you first posted it, and I can’t stop thinking about it. I wish I could buy it locally, but since I can’t, I may have to bacon down, er, I mean break down and order some. Oh, Tami, I cannot thank you enough for introducing this BaconSalt! I followed the link to Justin and Dave (love their monniker, “Bacontrepreneurs” *smile*). Now, not only great coffee out of Seattle, but bacon flavour without the guilt, too! Ships a lot faster and cheaper than getting it from Seattle.